Combine salt, ginger, coriander, paprika, and pepper; rub onto meaty side of ribs. COver; refrigerate 2 hours. About an hour before cooking time, soak hickory chips in enough water to cover. Lace ribs accordion-style on spit rod. Secure the ribs with holding fork. Arrange hot coals on both sides of a shallow foil drip pan. Drain hickory chips, sprinkle some over coals. Attach spit; position drip pan under meat. Turn on motor; lower the grill hood or cover with foil tent. Grill ribs over hot coals about 1 hour or till done. Sprinkle the coals with dampened hickory chips every 20 minutes. Combine apricot preserves, orange juice, soy sauce, and lemon juice. Brush ribs frequently with orange juice glaze during the last 15 minutes of cooking. heat and pass the remaining glaze. 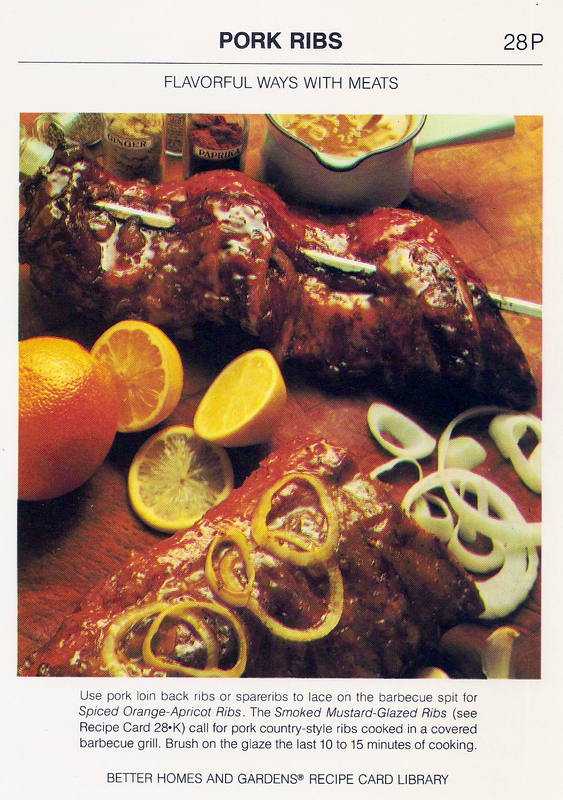 Garnish ribs with orange slices, if desired. Makes 4 servings.